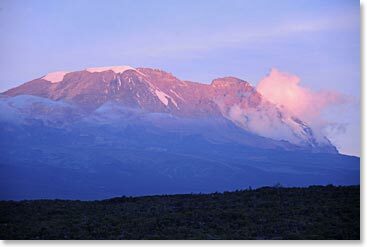 Join Berg Adventures, Patricia Walker and Matthew Doty, as they climb to Africa’s highest point, Mt. Kilimanjaro. Towering at 19,340ft (5,895m), this stand-alone mountain is one of the Seven Summits. We invite you to join their climb as we share their journey through our daily dispatches. This team of adventurers will travel along the plains of Tanzania, to the rainforests and dry alpine deserts, up to the glacial artic conditions at the top of the mountain. After their climb, Matthew will head back home to the United States and Patricia will journey onwards to the majestic plains of Tanzania, where she will continue her adventure on an action packed three-day safari. Her mission, aside from relaxing while taking in the natural beauty, is to discover and appreciate Africa’s “Big Five”, along with all the other diverse wildlife this continent has to offer. June 29, 2013 – An Amazing Safari – Goodbye Tanzania!